Join the Lab, grab my best stuff, & kick your sessions up a notch! Want to ramp up engagement during your talks & workshops? This collection contains 8 activities that'll automatically get your audience participating. Using the 5-step Engaging Talks and Workshops Road Map©, learn how to create interactive sessions your audiences will love. In this course, you'll learn how to create a solid foundation for your workshops and presentations from the ground up. Your template: Step 1 of the 5-step Engaging Talks and Workshops Road Map©. 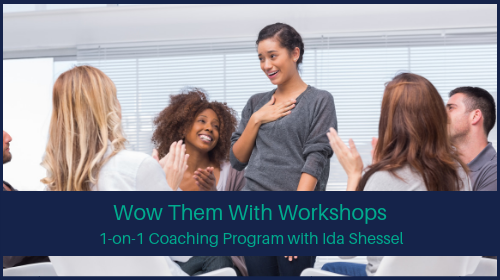 Join Wow Them With Workshops...a 3-month 1-on-1 coaching program that'll have you creating a life-changing transformational workshop, talk, or and retreat session that wins you raving fans!